SINGAPORE (IDN) – On March 21, 2018, the Chinese Communist Party (CCP) released its ‘Plan for Deepening Reform of Party and State Organs’. Among the 60 items added to China’s reform agenda, four were related to state media. That month, the CCP greatly increased the power of China’s so-called ‘Ministry of Truth’ — the Central Publicity Department (CPD). It also announced plans to create Voice of China, the world’s largest media conglomerate. Previously hidden behind state institutions, the CPD now publicly declares its control over all Chinese press and publications. The administration of copyrights, censorship and monitoring of foreign publications imports are only a few of the CPD’s new tasks. As part of its deceptive tactics, the CPD employs the names State Press and Publication Administration or State Copyright Administration when communicating with foreign counterparts. The CPD has been given jurisdiction over China’s film industry. The production, distribution, screening, import and export of films are all now officially under the control of party censors. The CPD has already tested its newly acquired power – on March 26, Call Me by Your Name was axed from the Beijing International Film Festival due to its portrayal of gay characters. The CPD’s film regulation wing, similar to the broader CPD, refers to itself as the State Film Administration when interacting with foreign entities. The Central Committee did not mince words when describing the newly formed State Administration of Radio and Television’s mission: “to maximise radio and television’s function as the party’s mouthpiece”. While the State Administration of Radio and Television is on paper a state organ under the leadership of the State Council, in reality the CPD has considerable influence over its day-to-day operations. On April 10, the radio and television censor permanently banned China’s most popular comedy app Neihan Duanzi, which triggered nationwide protests by angry users. The CCP also merged China’s leading state broadcasters into the Voice of China – now the world’s largest media organization – and placed it under the purview of the supersized CPD. The merger of China Central Television, China Global Television Network, China National Radio and China Radio International brought together over 14,000 employees. Listed as a public institution under the State Council, Voice of China is again led by the CPD in actuality. China’s revamping of the state media system has a clear domestic goal of tightening thought control. 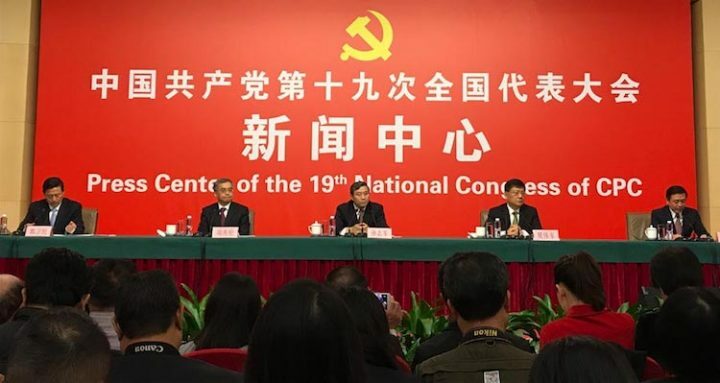 But the CCP’s Central Committee has also made explicit that the new setup will serve Chinese interests abroad, particularly by shaping global public opinion and fostering a softer image of China. The overhaul of state media follows the pattern of reform under President Xi Jinping as the party has concentrated more and more power in its own hands. Huang Kunming, a long-time confidant of Xi, currently heads the CPD. The CCP’s strategic approach to thought and ideological work is influenced by Chinese military theories that emphasise the weaponisation of information. Chinese military publications, such as the People’s Liberation Army’s Science of Military Strategy, regularly mention the need to control and shape public opinion during both peace and wartime. According to the Heritage Foundation’s Dean Cheng, “Successful public opinion warfare will influence three audiences: the domestic population, the adversary’s population and decision makers (both military and civilian), and neutral and third-party states and organisations”. Carefully crafted information, spread through civilian and military channels, contributes to winning the war of public opinion. The CPD is poised to take on a greater role in not only manipulating domestic public opinion, but also in stepping up China’s world media presence to give Beijing a greater voice in global affairs. While the Great Firewall prevents foreign media from reaching Chinese audiences, Beijing regards Western markets as fruits ripe for picking. The CPD’s plan to capture this market remains unclear at the moment. The focal point could be innovative programming and aggressive reporting following a model like Al Jazeera English, or a front organisation similar to RT that continuously challenges and snipes at the mainstream Western narrative. Voice of China will be most successful among countries and age groups that rely more on traditional platforms. Still, we must also pay attention to Chinese information campaigns on social media. The proliferation of pro-Chinese government social media accounts, ranging from Global Times Russia to China Police, is certainly part of China’s beyond-the-Firewall information operations. In recent weeks, Hong Kong and Taiwan watchers have also witnessed a sudden surge in Chinese bot followers. It is possible that China’s new media giant might operate hand-in-hand with this budding cyber army to push Beijing’s official viewpoints and suppress dissenting voices. In an era where foreign media has little to no influence in China due to the information lockdown, the CPD’s expansion and the creation of the Voice of China signals that China is getting ready to extend its capabilities in reengineering global opinion.